Email widget does not appear to work on Droid v2.2. There are no calendars available to select. Hi Ted, thanks for your bug report. I will have a look at it and try to fix it as soon as possible. Could you tell me more about the concrete setting? - Which Phone are you using? - Do you use the build in mail functionality of android or any third party tool like touchdown or k9? Ok found out, that android usually blocks all access to email-accounts from other apps (s. above). This means that no app can access the emails stored by the system email app. If you still want to use my app you have to install it as a system app (see above). I will try to build a support for third party mail apps (Touchdown, K9). They are using their own storage, so running as system app should not be required. Installed widget on Galaxy S home page and all appears to work well with Exchange e-mail. However, I do not get updates to the widget inbox for e-mails I modify using the widget (for example if I read an e-mail or delete an e-mail via the widget) unless I go back into and out of the Email Widget settings…then when I go back to my home page the e-mail list is updated showing my read items and removing the deleted items. How can this be corrected so the widget automatically stays refreshed with my changes? Per my posting last night about updates to widget. I was mistaken. The updates ARE applying….just seems to take a few minutes (which is OK). Nice application…will leave positive feedback at marketplace. Only one I have found that will work with Exchange via native Andriod mail. Look forward to future enhancements and updates. 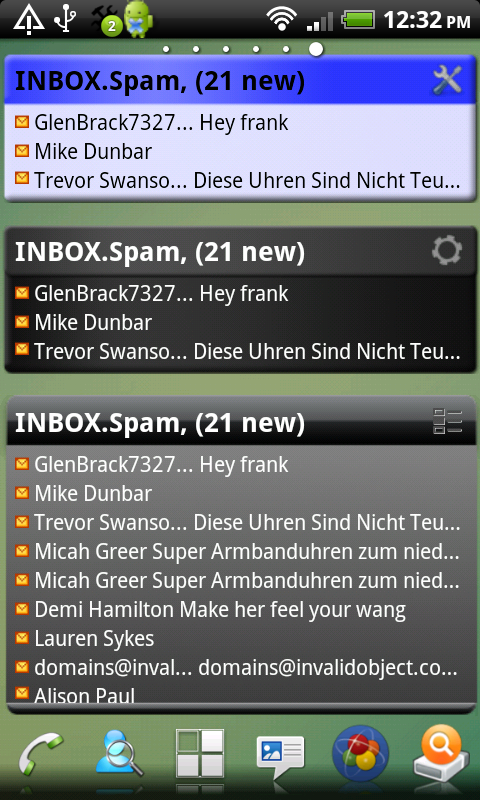 A nice addition would be the option to show UNREAD e-mail only (this is how this function works on the Blackberry) so the widget would filter and only show unread items. Thanks again & nice work. – Lowfu. thanks for your feedback, it is highly appreciated! I will add your feature requests soon, this is a nice enhancement. Let me know if there is more i can do. I already know about the late widget updates. Till now, i couldn’t find a fix for it. What i experienced is that each time the mailbox gets synced, the widget gets updated. So the more often you sync the sooner it gets updated. Hi mate, I’m using droid 2.2 / Galaxy S, just upgraded. Hopefully you can sort out how to access stock mailbox without rooting. Stock email is good enogh for me, just want the widget, but as written above, with only unread emails. Only good client found so far is Touchdown; but its terrible slow on Galaxy S, even after moving DB to SD. Good effort, but I can’t select a mailbox in the settings, which makes the widget useless. I am using a Samsung Galaxy S 9000 with froyo (android 2.2). Is there going to be a fix soon or would I have to run the widget as a system app? If this is the case you should announce the fact in the Android Market, please. How can I refund the 99 cent if I dont want to root my phone in order to get the widget working? Leider kann ich im SGS 9000 mit froyo keine mailbox auswählen. Wird das widget nur als system app meine mails anzeigen können? Das sollten Sie dann aber bitte auch im Android Market klar darlegen! Wie kann ich den Kauf rückabwickeln, wenn ich mein Handy nicht rooten möchte? Bitte ein wenig mehr auf die potentiellen Käufer eingehen und den Käufern klare Anweisungen geben, was zu tun ist, wenn sie rückabwickeln wollen, wenn sie nicht rooten wollen. James, please tell me, do you get a warning when opening the settings of my app, telling you, that android rejects access to your emails? If that is the case, my app will only work as a system app on your phone. Because of the very limited promo text in the market, i cannot go into detail why the app might not work for a specific configuration there. Do you have an exchange or googlemail account configured on your mobile? If this doesn’t work, send me your order number or name and i will cancel the order for you, so you will get your money back. I have to agree with James. If this will not work with stock email on 2.2 then you should publish it in the market so people can be aware before purchasing. I would love for the app to work as described but useless in 2.2 without rooting which I won’t do. I’m using Motorola Droid with 2.2. Ok, i changed the teaser text in the market so it should be clearer now. 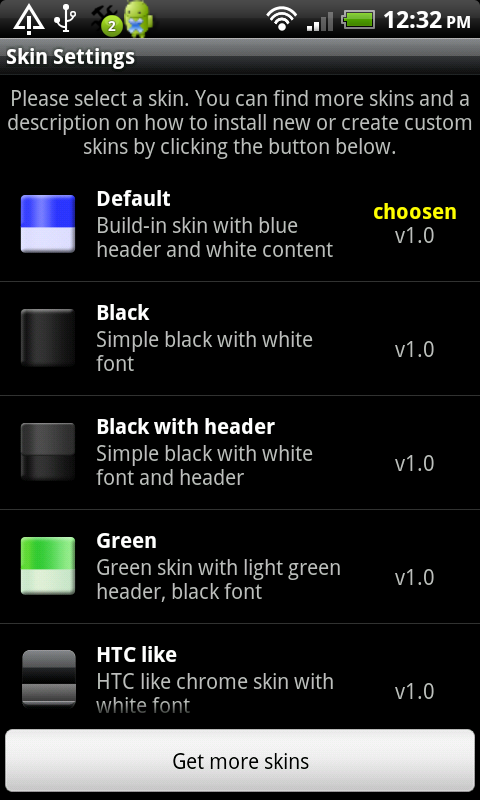 Works on my HTC Aria with K9. Only shows unified inbox, and only shows “Inbox” under “choose mailbox” options. But it does work. Doesn’t work with the “Android” option, but that’s probably because HTC’s default mail program is built into Sense. It’s not the default android app. Hey Derek, thanks for your comment. Nice to hear that it works on your device with K9. I’m currently working on support for the HTC buildin Email-App and this will hopefully be released the next few weeks. In contrast to K9 there will be support for all widget-features on HTC (unread, open Mail, open EMail app…). Works great on my HTC EVO! Thanks!! I follow your instructions to install the app into the system, but I found some problems. Now I can find it in the right directory. I have the widget working. What’s wrong? Normal HTC sense widget is working, but it’s only 4×4 so I purchased your app, but it’s not working. Aha … you have to select HTC option. thanks for your suggestion. This is already on the list of planned features and i will definetly work on this for one of the future releases. Before I buy your app: Does it support multiple Gmail accounts? And if I click a Gmail e-mail, will your open the correct mailbox folder for the account? i didn’t test it for multiple gmail accounts but it should work. Unfortunately the Gmail app doesn’t support opening emails or accounts directly, only starting the app is supported. You can try the app and if you don’t like it you can easily get your money refunded by just uninstalling it during the first 24 hours 15 minutes (see comment above). App works good on a Galaxy S Vibrant. Could be a bit better though. A unified inbox with colour coding (each account has different coloured emails or icon) would make the app perfect for me. Having multiple 4×1 widgets is an acceptable solution for now though. JKeep up the good work. The only reason I’m sticking with a Sense rom is the Email widget it includes. What I’m looking for is something like the HTC Email widget, but available for launcher pro…. you’re right, the design options are very limited right now. I’m working hard on the skinning feature but it is really a nightmare to implement, because android has no support or best practice for it. Hope to get a first version with limited skinning out in mid december. This app works well for what I need. I’m having a problem with 2 Gmail accounts I have. They are both setup under the Gmail part of the OS, not under email. One account is for company email and the other is for personal email. I added 2 instances of the widget to different screens. I set one to check work, one to check personal. When I click on the widget, both are linked to the same account. While I’m viewing email, I can change it to the other. The next time I bring up email through the widget, I see the last gmail account I was in, no matter which instance of the widget I click on. Running OS 2.1 on a Galaxy S (Mesmerize) on US Cellular. Thank you for any help you can provide. Running 2.1 on a rooted Nook Color. The widget is installed to /system/app/. Whenever I try to add the widget to Launcher Pro, I can select the settings, but the widget never actually shows up. Hi ben, could you please activate logging in global preferences and send me the logfile please? just to let others know: on nook color please use the back button at the bottom not on top to add the widget. Running on a Archos 101 running 2.2 Froyo and working almost perfectly (using Gmail rather than the built-in email). It would be nice if clicking on the email would open the email directy rather than the Gmail app inbox folder. I do see a bug though. For some reason I have 3 emails showing as unread with this widget but I see nothing when going directly onto Gmail. I can trace it back to the threads and go to every single email in the thread to ensure they are all read but still no luck. All those emails should “unknown” as source email address, maybe that will help identifying the cause. unfortunately Gmail doesn’t support opening mails directly. I can only open the Gmail app from my widget. Regarding the bug: would you mind to send me a logfile? You can activate logging by starting my app / global preferences from the app drawer and enable the logging option. After that please refresh the widget with the refresh button (or automatic refresh), go back to the global prefs and use the option “Email (Send mail to developer)”. You will be asked if you want to attach the logfile. Answer with “Yes” and send the email. Thanks in advance! Please help with install. I followed everything and TE cannot find the apk. I have searched everywhere for the apk. Any help or a refund please? using the guide with root/better terminal. but the directory names seem to have changed. under 2.2.1 (with root-access and better terminal)? Hi, is this support to work for Exchange mailbox on a HTC Desire Z without rooting? Im running 2.2.1 but it’s giving me the cannot access notice when I choose HTC Mail provider. is the 2.2.1 a very recent rom? Maybe HTC changed the permissions on the new rom versions. If you see this message it is not working out of the box. Please get in contact with me, if you want to refund. I already returned the app and got a refund, but can this be fixed for 2.2.1? I think it’s pretty recent and an update to 2.2. Send me a message on Twitter (Laur3ns) if you need more info. the message still pops up that it is blocked – what can i do? i love your app, but i am experiencing a strange problem. I am ruuning the widget on sgs on darky’s rom v8 and froyo. The widget is able to connect to my exchange account, through the stock email app. The only peoblem is that emails are only shown under launcherpro. In twlauncher and laumcher, the frame is empty and only the header works. thanks for your great proposal! I will have a look the code, it will definetly help me. Well, I hope it works for ya. The next closest thing I’ve found, which is not a 1×1 unread email widget, is the mail icon in Executive Assistant, but I do not like how it’s setup cause it gives a count of every email, not just new ones. It’s kind of clunky too. Also, I am very hopeful that you’ll implement skinning with this widget as well so we can give it a few different looks. So, I hope it works cause you seem to be the best hope at getting the one widget I’ve been looking for for months. please make sure that you don’t have activated scrolling for twlauncher, because it is not supported by this launcher. I tested the widget on a SGS and HTC Desire HD with twlauncher and didn’t ran into any problem. If you experience the problem without scrolling beeing activated please get back to me. A user helped me finding out that motorola has it’s own email client (BlurEmail) which is not supported by the widget until now. I am working on this for the next release. Just to let you know. Zshazlez, thanks again for your contribution. 1×1 widget is the next feature to be implemented, so stay tuned. Amazing widget (actually, the only one free that works with exchange accounts). I would suggest to make (at least as an option) each email item with two lines (just like in gmail – subject in the first line and sender’s name in the second one). This would impove readability. i will add your proposual to the feature list. Oops, sorry – this one is not free, I want to say that this is the only useable email widget with exchange support. doesn’t work on rooted droid 2. I did exactly what the directions said to do, still got nothing. 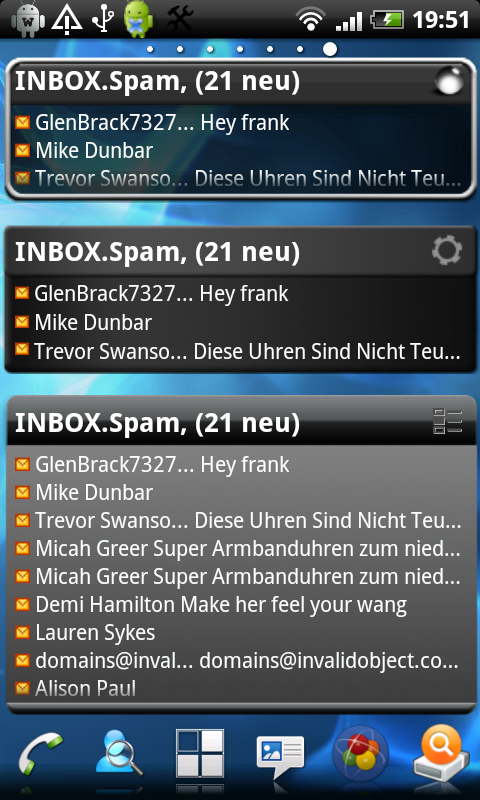 some days ago another user gave me the hint that motorola has put a custom email client on their devices. It’s called BlurMail and isn’t compatible with my widget right now. But i’m working on a solution. Hopefully the next release will support it. Downloaded it, installed it but whatever I do it wont work. Running 2.2.1 sense stock rom on desire HD. Is there a way to get it working ?. Looks briljant from what I have seen sofar !!. Hope you have a answer. Oh btw didnt buy it on marketplace but on androidpit. Was just about to refund since it does not work with MotoBlur inbox, but I’ll keep it in hopes you get it into the next release! I have been looking for something that can do that for awhile. xnappo, thanks for you for your patience. I already started to implement for BlurMail, but this is not easy for me, because i have no device to test it on. Anyway, i do my best. Running Froyo on Dell Streak. Got the widget running. Super Manager worked very well. Any way to increase font size? The text is tiny on my screen. Also, clicking on the email does not open it, although I can see the email font register the key press. Do i have to open the email box to see the email? more layout options, i.e. font size, are already on my feature list for one of the next releases. Regarding the other problem: Could you please activate the logging (starting app->global preferences), then click on an email, afterwards disable logging and at last send me the logfile by using the option “Email – send mail to developer” from the global prefs? This might help me to find out more about your problem. Just bought the widget and it looks nice. I am having one small issue you might be able to help with. When I select a message, it will does not open the message… Actually it doesn’t do anything aside from highlighting . It will load the inbox when that option is set, just not the message itself. I believe I have the settings configured correctly. I am running on a rooted HTC Incredible running MIUI 1.1.14.1 with adw launcher checking an exchange account on the stock email app. One other suggestion/thought. It would be nice to be able to set the text size. The message are so small, I think when we get it working im going to fat finger a lot. another user reported nearly the same a few hours ago. Please have a look at http://blog.invalidobject.com/android-app-email-widget#comment-578 . I have a Desire with a SenseHD ROM installed on it (rooted, of course), but no Sense launcher, (LPP instead). I am using the default HTC Mail app, which works great for Exchange push email support. Are you saying that I can use this widget, and it will pull the mail from the HTC Mail app if, and only if, I install this as a system app? you’re right. On Desire HD you have to install the app as system app. This might not be very easy, because the DHD has a special security feature called s-on. You have to put it to s-off in order to install under /system, even if the device is rooted. I posted a link to xda-developers above, explaining how to remove s-off. Thanks foo.bar for the clarification. One alternative to doing this with s-off is simply booting into recovery mode, mounting /system, and using the user friendly AndroidCommander. Does this work for other mail widgets (being pushed over to /system to gain access to the HTC Mail) ? flyte, you’re right. Using recovery mode would also do the trick. I don’t know of any other app that is able to access the HTC Mail App. That’s the main reason i build my app. Tried this on a 2.1 SE X10. Doesn’t work at all despite statements to the contrary above. Hangs, and once in a while actually manage to get to the settings screen. Once, after much frustration and a reboot of the phone I was actually able to get the widget on the screen. But no emails appeared. Ever. Config is SE X10 with 2.1 Global running ADW+ as home screen. Doesnt work. Of course, TRYING to get this to work took longer than 15 minutes, so was unable to get a refund from the market. i’m sorry that you had some problems with my app. Please mind that on large mailboxes there could arise some performance issues, i.e. launcher get’s stuck. You should limit the number of mails then to 30 or 40, for smaller widget sizes also 10-15 makes sense. Could you also please try to deactivate scrolling and tell me if there are still performance issues? Like the description on the market says i will refund the money to you if you experience problems or don’t get the app to work! So please don’t mind. I hace an HTC HERO on 2.2.1 and cannot make it run. When I try to do it through the file manager process I get an out of storage memory error when I try to copy to the system folder. When I try co copy trough the terminal process I get a Can replicte ownership error. it seems that your mobile has a special security feature enabled (called s-on), which prevents you from modifying the system volume (see above). You can either try to turn your device to s-off or use the recovery mode and an update.zip to put my app there. Unfortunately both alternatives are not easy to achieve, so i can offer you a refund if you want. - Also i got an bug in android 2.3, you can’t open an specific email from within the widget, when will that be fixed? thanks for the feedback. More layouting options are already on my list and i hope to get out a release in the next few weeks. 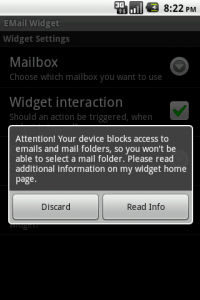 On android 2.3 the permissions got a bit more strict so that my app now cannot open a specific email with the mail app. I am working on a preview function to show the mail without the mail app. Just wanted to give you a little more info on my issue. I just switched to Cyanogen, to experiment with a few things, and I am still having the same issue. Can’t open messages, only inbox. Not sure if that is at all helpful, but thought you would like to know. sorry just read the post above… looks like you’re already on it. I installed you email widgit on my Samsung Epic 4G, running Android 2.1. It’s reading my Exchange inbox, connected to the stock Android mail app. It doesn’t seem to refresh itself. New mail does not show automatically and read mail does not dissappear automaticaly. If I press the refresh button manually, both processes work fine. Anything I need to know or do to enable auto refresh? will it be possible to show mails from lotus traveler inside of the widget? thanks for your comment. Yes i’m already planning to implement a preview which shows the mail without mail app, so this will work on all roms / devices. If you have update issues please activate the periodic auto updates. You can reach this setting by opening my app (not the widget config), activate auto update and set an update interval. I’ve set it to 40 secs on my device and this is working quite good. Hope this helps. no sorry Lotus Notes Traveler is not supported right now. That solved my update problem. Thanks for the help. App works great now! I purchased your app yesterday. Congratulations, this app will be exactly what I need to make my SGS a business machine. 1. Not sure what happened but I was editing the details of a widget yesterday and ran into a huge lag (had to restart phone). It’s fine now. 2. Is it normal that the widget does not refresh automatically? 7: Option for maximum characters for sender name, e.g. in the options we could chose to show only the first X characters of the sender name. You seem to have it by default at 12, I could do with 6-7: more space for a date field and subject. BTW re the update issue, I did tick the auto refresh box in the app menu, does not help. thanks for your very detailed feedback, i appreciate this a lot! 1) I have already worked on the lagging issue and the next release has some big changes for it. Some other users have reported this, too, and i tested with them the new version with success. - go back to the global prefs, deactivate logging and hit the “email – send mail to developer”. you will be asked to attach the logfile. 4) one of the next version will have some new layouts and one containing the sender (maybe as a picture from your contacts) and the date/time. Hi Frank, thanks for the detailed answer. Its working like a charm now. I limited the no of emails to 15, did the trick. One other request: Support for gmail labels? Great app, works on galaxy S on froyo and K9. I have one problem still. All my email from K9 (exchange) remains unread, no matter how often I read them. Any ideas? Please leave a comment and star the issue there. This hopefully raises the chances to get this implemented. with the recent version (5.2) i added support for Moto BlueMail. Please have a try. This will work only with root and as system app though. thanks for your quick reply. I followed your steps on making it a system app, and now it works fine. I prefer the K9 interface though, but for now it suits me just fine. das K9 bekam ich auch nicht zum laufen. Empfehlung einer Anderen ROM oder nch paar hinweise? This app is very useful, and from I can tell, one of a kind. However I’ve had to uninstall. The auto update process (refreshing the widget with new emails) consumes so much CPU on my Samsung Epic 4g (andriod 2.1, 1ghz proc) that it drags everything else to a halt. It even makes my media players skip. Why the need for such a memory sap? Also, the alternate skin I selected would default back to the blue and white default skin every time I restart the phone. Very annoying. Would love to reinstall this app, but it needs improvements or order to be usable. Please keep us posted if a subsequent release fixes these problems. Did you experience the performance issues before or after the update to version 5.2? I changed the update mechanism completly, so in most cases the auto update is not needed any longer. Also i fixed a few performance issues which might occur on the last releases 5.0 or 5.1. If you’re already on 5.2 then please check size of your mailbox. If it contains a large number of mails this might still slow down your phone because it will query all these mails when refreshing. You can limit the number of mails in the widget preferences. Regaring the changing skin: This is a really strange behaviour and i had no other complaints about this. Please check the following. if this doesn’t exist, please create it manually. This should now contain a widget configuration file called EMAILWIDGET_PREFS_X.xml where X is the number of the widget. Please tell me, if the recommendations above solve your problems. I can confirm that, like the HTC Desire HD, Email Widget only works on HTC Desire Z after rooting it. The two devices are very similar in software. After rooting and following the instructions on this page the widget works normally. Which I’m very happy about because it’s the perfect widget for my needs. I hope Android will fix this problem some time, so legitimate apps like Email Widget can access your inbox without having to resort to hacks like rooting. Instructions for permarooting the Desire Z are available online in the usual places. I bought your app and tried to setup the unread widget with my SGS i9000m stock email client. I can’t seem to see my hotmail inbox when I tried to setup. The mailbox selection is blank. I bought this app for my hotmail account but I can’t get it to work. Since I can’t get this to work, I’ve cancelled my order within 15 mins. Does your app support it? if yes, I will buy your app again and can you please let me know what went wrong with my setup? and opening its preference dialogue? on how to do this on my website. Yes I have android 2.2 and root access, and I’ve followed your instruction and move the app to /system/app. I’m going through the setup for the unread mail widget on my home screen. I select ‘Android’ mail client, but there are no mailbox for me to select. - I have my hotmail configured. When I select ‘Gmail’ mail client, I can see my gmail mailbox for selection. I am brand new to Android, and I have had my Motorola Atrix for just under a week now. I thought that the general user community disgust with MotoBlur was exagerated, but sadly, I was wrong. Her is my one weird problem. As you know, the Atrix come with a fingerprint reader to unlock the phone. I really like it, and it has been working flawlessly since I got the device. But the second that I set your widget up as a system app, the figerprint scanner quit working. I can still get in using the pin code, but the scanner refuses to read my finger. It is hard for me to imagine how these two things can be interrelated, but they are. If you have any idea what might be happening, please let me know. I want to keep your widget active, but I want my figerprint reader more. Thanks for your help, and thanks for a great widget. For other users: kbanes resolved the issue with a factory reset. It seems that the widget wasn’t the reason for this behaviour. The user is keeping me up to date and i will add a not when we found out about the problem. I have an email widget set up and have it set to open email when selected for the”open action”. I assume this is supposed to actually open the body of the message…it doesn’t do anything at all. I am running the Liberty rom but I think it was doing the same thing on Apex rom. I am using a Droid X.
thanks for your contacting me. The issue you described is a known “bug”. On some devices the android permission systems prevents my app from opening the android email app and displaying a single mail. I’m currently working on this by providing a custom viewer that is integrated in my app. This will be implemented in the next release. triggered by the Android-Hilfe Threat I bought Email Widget this morning (V5.2). Actually, I don’t understand, when the widget is updated. Provider is GMail, Mailbox=INBOX. I send a test my to my own account, GMail get the Mail and my HTC Magic shows a Mail Icon in the Status Bar. Sometimes the mails are immediately updated in the widget, sometimes it takes pretty long )if ever, I was never patient enough). Same if I delete Mails im the browser on my PC. The HTC Magic recognizes that that mails are deleted (Icon in status bar disappears) but Email WIdget still shows New Mails (I waited for about 15Min). 1) About 1/3 of the 4×1 Widget is wasted by the “INBOX (0 new) ” Statusline. Is there a chance to increase the space for the important info (the mail Headers)? 2) I assume, the widget will not automatically update via the market, since it’s stored in the /system, right? 3) In Provider, I can select ‘Android’. What is this? 2) If you installed the app under /system/app you have to move it back to /data/app before updating, but it should be possible then. After the update you have to move the app back to /system/app. 3) Provider=Android should be used to get mails from the android stock mail client. This is pre-installed on many custom roms and also on some devices (i.e. samsung). Some manufacturers have made their own mail app (htc, motorola), so you should use the specific provider for them. I’ve installed Email Widget and tried to start it. I got the message you discribed above belonging Root Access. Now I’ve the issue that Super Manager could not set Root access at my Phone. What are the next steps? How could I get root access? Any recent word on whether this works with the Motorola BlurEmail client? Rooting is OK, but it has to work with BlurEmail — that’s the only decent client I’ve found that comes close to properly handling invites. thanks for your comment. My app supports blurmail, but until now there is a small bug in the implementation. The mail status of the displayed mails is inverted, so unread mails are displayed as read und vice versa. A fix for this will be out soon. I bought your app yesterday. Running Samsung Galaxy S, Android 2.2, rooted. After following the steps to the system folder, the widget worked (source: exchange). I was able to open single mails. However, after rebooting my device once, opening single emails didn’t work anymore. Is this the known bug you described a few times above? Or is this a different issue? And another bug I noticed: After rebooting again, the widget didn’t load at all anymore (it just kept “loading”). Had to delete it and add it again. Great job on the mail widget! Would it be possible to add Maildroid compability? This is the best email application, according to me. unfortunately Maildroid doesn’t expose it’s content to third party apps. So until now i don’t have a chance to access the mails. Interface seems to be running fine EXCEPT I get *no* email notifications whatsoever. I am on a rooted SonyEricsson X10 with stock SE 2.1 ROM. My mail app is K9 3.6.0.4, and this IS set as mail provider in emailwidget. I can tweak parameters all I like, but no joy. I am getting the “Your device blocks access to emails and mail folders” (always have…) although the table above says the widget is ok on the X10. however, I thought this only applied to the Android email provider and not to K9. Managed to get things working again, BUT having to install the widget as a system app. Grateful if you could update the compatibility table for the Sony Ericsson X10 as it does seem to require the app being installed as a system app. Is there any way to select mailboxes other than “INBOX” for the K9 provider? - It does not support opening mails, only opening the app. Please vote for it and leave a comment, because this might help to push the feature up in the feature list. Please provide working instructions on how to install on dell streak with 2.2 Android. Both options provided on top of this page do not work anymore. Thank you! Some of the widgets do not work on my Motorola Android 2 Global. I can get the 1×1 and the 4×1 to work but none of the others. I just see the background but no email text for the others. I really wanted to set up a 2×2 or 4×2. - Is it possible that I cannot go directly to the Email message, but I only jump to the Inbox? (divice blocks access, stock android app is not installed (?). Does this cause problems for the widget? - If the mails are not shown go back to my app, deactivate logging and send me the logfile by using the option “Email – Send mail to developer”. You will be asked to attach the logfile. With this i’m able to do a deeper analysis of your problem. The error you see indicate that your phone does not allow access to mails of the core android mail client. Unfortunately this is the default behaviour of android devices and can only be adressed by rooting the phone and installing the app as system app. thanks for the great app, I experience one problem though. My inbox (ms exchange) will not sync or fetch new emails once I select the specific folder in the widget. Once I select a different folder in the widget (e.g. sent items), new emails arrive immediately in my inbox. Everything else works fine (showing/selecting/reading already downloaded emails). I am doing something wrong? ps. I’m using a samsung galaxy s, rooted, custom darkyrom 9.5+dark core 1.0 kernel. I also made your app a system app. i’m already working on support for enhanced email. Will hopefully be available in one of the next releases. strange behavoiur. No other user reported such an issue and i tested the app on my own samsung galaxy s successfully. I suppose it is an issue of the ROM. Unfortunately i didn’t test my app on this ROM. But one question: Does it sync the folder if you explicitly request a sync from the mail app? it didn’t work with explicit requests either, in the first place, but after a few reboots (where the widget wouldn’t load, had to remove it and reload it again) things started working, first explicit requests, then auto sync and now also the loading at start-up. Trying to follow option 1 to install but having problems with Super Manager. Phone won’t find it in Market Pace but I can find it on the website from my PC. Says ‘device not compatible’ when trying to install over usb. Running android 2.2. Any ideas? 1. 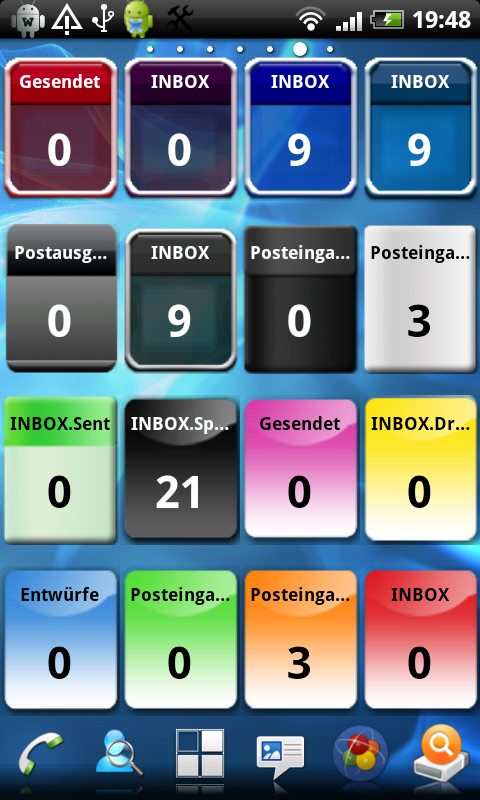 If there are no New mails to display can the widget display “No new mails” or something instead of Blank. thanks for your comment. I’m sorry, but i didn’t quite get your issue. In case there are no new mails the widget displays “(0 new)”. This does not work for K9 though, because the app doesn’t support accessing the email status (see above). I am using Android Native Corporate Mail client with “Display only New messages” option. When there are no new mails I see “0 Mails” on the header instead if it can display couple of words “No New Mail” centered in the widget with increased font size similar to how GO SMS widget displays when there are no new SMS, that will add to aesthetics and also easy to ready when there is no new mails to read for me. did you activate scrolling for the widget? Then you have to use a launcher app that supports scrolling. The default launcher of the xperia doesn’t support scrolling. Please try to deactivate. You can also try to limit the number of emails shown in the widget. If your mailbox contains a large amount of mails this is mandatory. And of course you have to choose K9 as email provider in the widget, but i think you did this already. ok now i got what you want. If there are no new mails the body should only show a message in big letters, saying “no new mail”. I will add this to the feature list. I have a rooted tablet and installed the widget as a system app. Everything seems OK except that I cannot select and display an individual email. it just flashes but does not display the email. if I change the option to open the inbox when the email is selected that is OK. I am running the standard. Android client connected to a corporate Exchange system. I installed your widget, as a system app, on my my rooted tablet I am using the native Android email client connected to a corporate exchange email system. When I click on an email it will not open. It flashes but nothing happens. If I change the option so that the inbox opens then that works OK, but I cannot open an individual email directly from the widget. you came across a known bug. On some devices android blocks opening the emails from the widget. I will add a custom viewer in the next release, so that you can use it to view mails directly from the widget. Thanks Frank. I also have similar issue as Pearly King after I upgraded to Phantom King (rev3b) ROM. Will wait for your customer viewer option. Frank, just installed the widget and put a new skin, and it works great. However, I’m having the same issue with the single email viewer as the folks above. When is the new release slated for distribution? Also, will the new release include a “Preview” in the widget? thanks Frank, was looking everywhere for this widget! i can’t really say when i’m able to finish the custom viewer but i think it will be sometime in the next few weeks. I will shoot out a twitter message so if you like you can follow me and get informed as soon as it will be released. Android market won’t even let me buy and download this widget in the 15 minutes trail period window. Therefore due to deficiencies in the Market, I am unable to buy your software. thanks for your message. If you experience any problems with android market you can also get my app at androidpit. If this also doesn’t work, please let me know. I’m not s-off – can you let me know how to turn the apk into a zip file for Recovery install? Hey If your having the cut/pase issue u´ll prolly need to S-Off your Desire ( As mentioned above ) Just follow this guide, super easy and n00b friendly! Worked like a charm, 1st try. I really like this app and I’m determined to get it to work on my Evo! My problem has been the lack of support for automatically updating Inbox subfolders with the stock email app. Without that feature, I have to manually go and refresh the folders before their email will show up in the widgets. As a workaround, I tried installing the email.apk for the Nexus One on my phone, and it worked great! My folders were finally getting updated automatically. However, when it came to linking the Email Widget to the program (installing the app as a system app), everything worked fine EXCEPT for the ability to open email straight from the widget. Even though my settings were set to open emails from the widget, it would just highlight the email entry on the widget without actually opening it. So I’m continuing my search to find a way to get this working the way I want. I’ve downloaded Improved Email and it appears to be working great, but sadly Email Widget doesn’t recognize it. Any chance we could see Improved Email working with this app soon? don’t know about the problems with the evo. Maybe you can try to activate auto update in my app, but this will only refresh the data stored on your phone. If the mail app doesn’t poll for new mails this won’t help. The other problem with standard android email client is already known and a bugfix will be out for the next version. Improved Email isn’t supported right now. I tried to get in contact with the developer but he didn’t respond. Frank, I’ve been using the widget for a few weeks now and the major bug I am having is the non-reload upon re-boot that Marco mentioned in the Post on March 17th above. Reboot=delete widget, re-add and reconfigure customizations. This and the open single email mentioned by previous users and my request for a “preview” in the widget. Thanks in advance Frank! thanks again for your comment. I had some conversation with the other user, Marco, via mail and he said that the reload issue wasn’t reproducable. We also found out that the launcher he was using (Go Launcher) had a bug in the version he was using, so you might try out another custom launcher. Also please try to set a limit of mails shown in the widget to i.e. 15 or 20. On large mailboxes there might be some performance issues with my widget, because all mails are queried from the mail database. Maybe this prevents the widget from reloading. If this doesn’t help, please get back to me via email and we can do a some more investigation of your problem. Is ther any way to skin the 1×1 Widget to look more like an app shortcut – just an icon, with a counter in the corner? thanks for your comment. Unfortunately the feature your are looking for is not currently implemented in my app, but it is on the list of planned features (“Support for icons with unread count as bubble like SMS Unread Count”). Thanks. Are you aware that on QVGA screen (e.g HTC Wildfire) the 1×1 Widget is actually about 50% too tall, so it gets truncated half way down the counter. Just wanted to let you know that the widget works on Honeycomb tablets (Acer A500), but only when rooted as with most modern android phones. The installation procedure on this page works exactly like on my 2.2 HTC phone. But there is one small thing that doesn’t work: tapping the widget to open the inbox or message does nothing. Maybe the activity has a different name in 3.0 or something. Could you look into supporting that? Other than that, the widget works very well on my shiny new tablet . The default email widget that comes with the tablet does not support showing two widgets with different inboxes, but your widget has no problems with that. I am using the app with my gmail account on my HTC Thunderbolt, running Android 2.2.1 (latest official update from Verizon, last 5/13). It was was working great until last night (before and after update–though I just got the phone and installed a week ago), but now, most of the time when I click the widget, nothing happens. I removed and replaced the widget, but it is not working better. Before, it would open up the gmail client every time I clicked, as expected. Any idea what might be wrong? Thanks so much. Purchased but rather dissapointed. Need buttons for delete, mark as read, or just anything when you open up the “internal viewer” since opening up the email doesn’t work anymore(why not just remove this option until its functional?) Also, why no html support in the internal viewer? Is this going to be in future releases? I like the fact that its specific to email, since it is called email widget, so I think you should stick with email only so we can make the most of this app for what it is supposed to be used for (noting the vote about facebook support). Have you also looked into a possibly quick reply box? thanks for your comment. Please let there be room for improvement I am already aware that the current internal viewer is only a starting point and i will definitely work on the features you described. The “email open action” does work on some devices, but not on all so i don’t want to remove this feature. Regarding HTML support: This seems to be a bug for the android email client. I will provide a bugfix for this soon. I would love to get more info about the quick reply box from you. I don’t know if you have ever heard of an app called SMS Popup, but it simply takes the incoming sms and delivers it in a fancy pop up window so you don’t have to open your messaging app. In this little window there gives an option for close(which marks the message as read), delete, and reply. After going through the settings you’ll find an option for quick reply, which uses an “internal viewer” of sorts and simply opens a text box so you may quick reply directly to the person without needing to go to the thread or messaging app. Also, have you looked into “Pure Messenger Widget”? It is basically your app just bloated with options and a little resource hungry, which is why I looked into your very simplistic app(please keep it this way lol). Pure has a LOT of good options but they are more focused on general social gathering of information rather than just email. Maybe you could get a few ideas from there as well. this might be because of a bug in the handling of gmail accounts. On some devices there were some permanent refreshs of the widget so the touch events might be absorbed. Just fixed this bug. Please update and tell me if it fixes your problem, too. thanks for your suggestion for improvement. I didn’t know SMS Popup so far but there are some nice features which i also could adapt to my app. Actually i want to improve the internal viewer to get some more features like marking mails unread/read, replying or deleting mails. Unfortunately this is very specific to devices or email apps so this is no easy task to achieve. Pure Messenger was in some aspects a reference for my app but i want to keep focused on mails and supporting mail apps. If there is anything that pure has which you would like my app to support as well, just let me know. Hey Frank. Have an issue. Widget working perfectly for the past 3 months, but after I updated to v5.3 three days ago, the widget been using 20-25% CPU permanently, draining my battery in 3-4 hours compared to full day before. Had to downgrade and lost my settings. I’m on SGS with Froyo. Thanks Frank. Will thry new one. I forgot before my last post I had a resent titanium backup from 5.2 with settings and all, so I can revert to that. Still love your widget, probably the single most used app/widget on my phone. Thanks so much for addressing my problem so quickly! I installed the update last night and, so far, it is working. If any issues come up again, I will let you know. From what you said earlier is on point about the read/unread, delete, etc. buttons that should be implemented into this app…the only other options that I think you should look into are: 1) Pure’s message preview instead of just the header text in the widget. 2) The ability for prev/next options in the internal viewer. 3) When hitting refresh it should have the ability to set wether to refresh just the widget or to resync with your mailbox (similar to Pure’s refresh button). If I can think of anything else I’ll let ya know, keep up the good work on this increasingly great app!! thanks for the great proposuals. The first one was already on my feature list and it is the top rated feature so far, so this will be implemented for the next major release. I added your other feature requests to my feature list above. Will it be supported enhanced e-mail ? it is very good app , but they have no good widget . it’ll be nice to support this . thanks for your comment. I would really like to support enhanced email but this client doesn’t expose its content to third party apps. So currently there is nothing i can do to support it. Just switched to ADW Launcher & I notice that on GMail accounts with “unread only” no mails are shown if “Scrolling Widget” is chosen – only the unread count appears; turn off scrolling & the unread headers are shown. I have just purchased a samsung galaxy and (to the best of my ability) have read through and implemented the above. I really like your widget, but before going for the new feature you mentioned, I would really love to see two basic features -or am I to dumb to find them. I like the look of your widget. I have a ASUS Transformer tablet and assume I need root for your app. Not looking for a refund, think you guys work hard enough for little to no money, but any help is appreciated. Great stuff, I’m using it on my both A.droid phones but this widget has some small issues with these new ROMs and new stock mail apps. See on the new updates…. - DO we have any way to disable the tap action on header? on 1×1 widget, when the header tapped it open the widget settings instead of the email box. Tap on unread number it is ok. Disable the full widget interaction is no way. - It should be fine to edit the text in Header (yes, I’ve seen the vote). 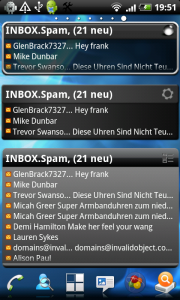 I have 3 email boxes and all of them has Inbox, so on the screen there are 3 widgets with the same text. It’s a little bit confusing. Thanks your time and work! I’m afraid that you cannot disable the action for the header until now. I will add this to the feature list. Actually if you would be able to disable it one cannot get the the preferences of the widget any longer. The INBOXes being named the same ‘INBOX’ is easy to solve. Just download the skins and change the ‘background.png’ to include the logo, e.g. GMail logo, yahoo logo etc… Then when you select the skin you simply pick the one with the logo you want. A little patience is required to get the background.png just right and remember to have a transparent background if you want a more professional look. Great app. Searched everywhere for a good email widget when I dropped the sense rom. This is by far the best. Andy above has a good solution for the header bar….. perhaps they could be pre-added and people could select from “hotmail” skins etc….same skins in each category but with the main mail clients. The biggest improvement I could suggest would be sender and subject in bold on one line with a line of preview text below. Nice idea, but I couldn’t get it working… more specific, it simply doesn’t update automatically. I always need to refresh…or is there any (hidden) switch? Thanks for your message. My app should also work on the desire s. I suppose you have installed my app AFTER K9. Unfortunately this doesn’t work, because of the android permission system. Try to uninstall and reinstall my app. If this doesn’t solve your problem, please get back to me. Please find the auto update setting in the global app settings, It’s not in the widget settings. Yes!! works perfectly in Desire S, uninstall and reinstall and all ok! Tnx. Hi Frank, I have an issue. I updated my Gmail app to the latest recently (I believe I had not updated it since I bought this phone end of last year mostly because the app is not available in the market in China). Since then the widget stays empty. I tried recreating one with no success. My other widget for exchange email works fine. Any solutions? Google has changed the permissions for the new version of GMail. Please have a look at this blog post, which explains the details and a common solution. you don’t have to uninstall my app you just have to replace the GMail app on your phone with the one provided by the link. They have limited access because of security issues. Doesn’t work on epic touch 4g (galaxy s2) with k9. Any idea how to get it working? please make sure that you install my app AFTER installing k9. To fix this please uninstall my app and then reinstall it. Keep up the good work! Worth its money! thanks for your feedback. The combined inbox is one of the top rated features. I will do my best and work on it on one of the upcoming releases. Installed and working in my Tattoo, as system app (CM7 custom rom), but no scrolling on widget, and no skinning option on menu. Skinning should be an option in the widget settings. But please mind that you have to install the skins by copying them on your sdcard. You can find my skin page here. I am experiencing the “known bug” about �?Open Action�? set to “Show Email�? witch does not open anything. I am using Galaxy Note stock rom KK5. Any improvement to come ? Otherwise the app is running like a charm for me ! Thanks for this very useful app ! Could you setup Email widget size 5×1 to 5×4 for larger phone like Samsung Galaxy Note ? thanks for your message. Unfortunately this is a limitation of the Android system. This can only be fixed if the core mail app of Android is changed and allows third party apps to view mails. I’m sad that i can’t do anything about it. But that’s the reason why i provided a custom viewer. I will add those widget sizes in future releases. I am enjoying the app so far, running great on my D2 running Cyanogen. I was wondering if it is possible to have it clear the new mail notification? Im thinking that this is probably the fault of the Enchanced Email program however. i’m sorry, but the Android system doesn’t allow to remove notifications that belong to other apps. So there is nothing i can do about. Please get in contact with the author of Enhaned Email. For instructions on how to get Gmail working on your Android device along with the “.apk” file… Follow this link. I’d love to download this app, I just got k-9 for my new phone and it’s making it a lot easier to manage my emails, apart from not having a widget. The only issue is that i’m on Android 4.0 which it says is unsupported. I’m wondering, by unsupported, does it mean it won’t work at all, or… that there is no support for it if there are problems? I’m also wondering roughly when it will be supported, as i’m eager to buy this app. thanks for your mail. Actually k9 is still supported for Android 4.0, it’s just the Android core Email App that isn’t supported any longer. If you have any problems in using the app just let me know and i will try to help. When i cannot find a solution/fix for your problem, you will get your money back. Thanks! Will download now and take a look. I’m a dev myself so know the pains of supporting lots of devices. I installed the app as a system app but it still doesn’t let me access the Android email. Sorry, but there are only K9 or Enhanced Email as alternative on ICS. Both apps are supported by my app on all Android versions / devices. I tried Enhanced email and your widget doesn’t work either. It doesn’t refresh at all. First time i install it it shows everything, i can even click on the emails and it works fine, but i cannot scroll and the widget doesn’t refresh. Actually i have to revise my last statement. If i select Scrolling then the widget will show empty (i use Apex launcher), if i unselect that then it’ll show the emails although if i click on an email it’ll not show the right one but just open the mailbox (i chose “open email” in the options). Plus, when i receive a new email it doesn’t show but it does say 1 new in the bar. Guess that was a waste of money I’m disappointed in Android bad email system (their widget stops refreshing after a while) and it doesn’t seem that there is any alternative widget that works properly. BTW i also tried to put it as a system app with no luck. Ok, so I installed Go launcher because i wanted to check if it would work better and it works indeed. Scrolling works with some other widgets so I’m guessing that’s something that should be fixable. Anyway, just so you know! Quarkz… I’m using Apex with K9 and it seems to be working fine for me. OK, so updating my Atrix to Gingerbread puts an newer version of BlurEmail on the phone. However, you supported Motorola still works, but the widget doesn’t know it works. So when I select Motorola I get the message that it isn’t installed but then almost everything works. So the content providers are all the same and the widget properly accesses it, but can’t detect the application itself. The only realy problem this causes is that the widget can’t launch the email program, which is a big nuisance because i have to truncate the widget to make roomo for an separate icon to launch the email application. I think all you have to is change the detection to look for the new version, and/or the content provider, or manually set the intent to launch the program? Let me know if you have any questions. thanks for the info. I will have a look at it. I was able to setup as system app and use with enhanced email but it gives me access to every inbox except the Combined inbox. I would prefer not to have several widgets and instead just have one like Pure that points to the Combined inbox showing only unread emails…..is this possible. So um.. is this app still availible? I can’t seem to find it anywhere..
Touchdown is the best Exchange app Period and your widget would complete it. Touchdown is HUGE on Droid & getting bigger, but their email widget is PITIFUL! EVERYONE AGREES ON THIS, just check it out yourself. Anyway, and nonetheless, this is the best money on a widget I’ve ever spent. ADWLauncher EX, though not my absolute fav, functions perfectly with your widget in all aspects including resize, scroll and refresh. thanks for your comment. Unfortunately Touchdown doesn’t provide an interface to access the mails stored with it. I’m sorry but there has to be a change on the Touchdown side. I already contacted the devs of Touchdown but never got a reply. I suppose they don’t want third party apps to integrate in their app.